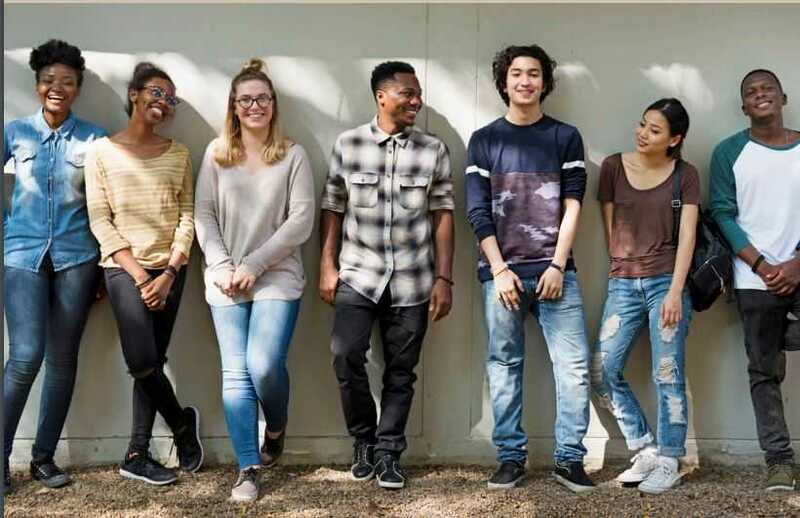 Although NRS is a confidential service, the crisis services center tracks contacts’ demographic information, such as; age, gender,the type of crisis, the youth’s status at the time of the connection and other pertinent data that builds an understanding of what youth are confronting. 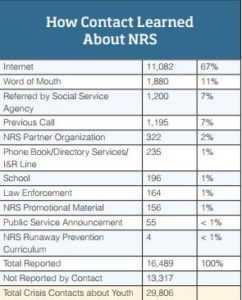 Annually, NRS provides the statistics from this data collection for the public in the crisis services statistics section of the website. Biannually, NRS contracts with a researcher to produce a trends analysis comparing over fifteen years of data. In 2017, the Family and Youth Services Bureau, NRS’ funding partner, produced a crisis contact report looking at the 2016 data. Some of the main observations the Crisis Contact report contains are highlighted below. The vast majority of those who contact NRS are youth (74%). Connections include calls, emails, online forum posts and chat messages. NRS also receives connections with parents, guardians, relatives, and other agencies. Most were between the ages of fifteen and eighteen (72%). The majority of contacts (67%) found NRS through the internet. The data indicate a continuing trend of youth contacting NRS via digital channels, which also includes social media. This helps NRS’ crisis services center to prioritize its resources towards NRS’ digital channels. 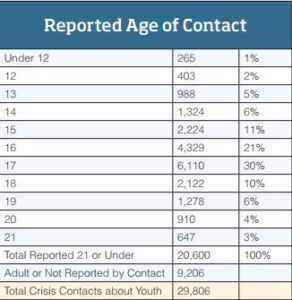 Youth who contacted NRS did so during a time when they were dealing with a crisis (36%) or contemplating running away (35%). Most were contacting NRS from their home (50%). 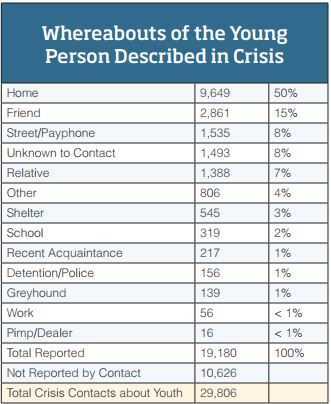 This indicates that youth are choosing to seek out help before deciding to run away and that NRS is helping more youth before they put themselves in unsafe situations on the streets. Most were dealing with issues related to family dynamics (35% of issues reported). 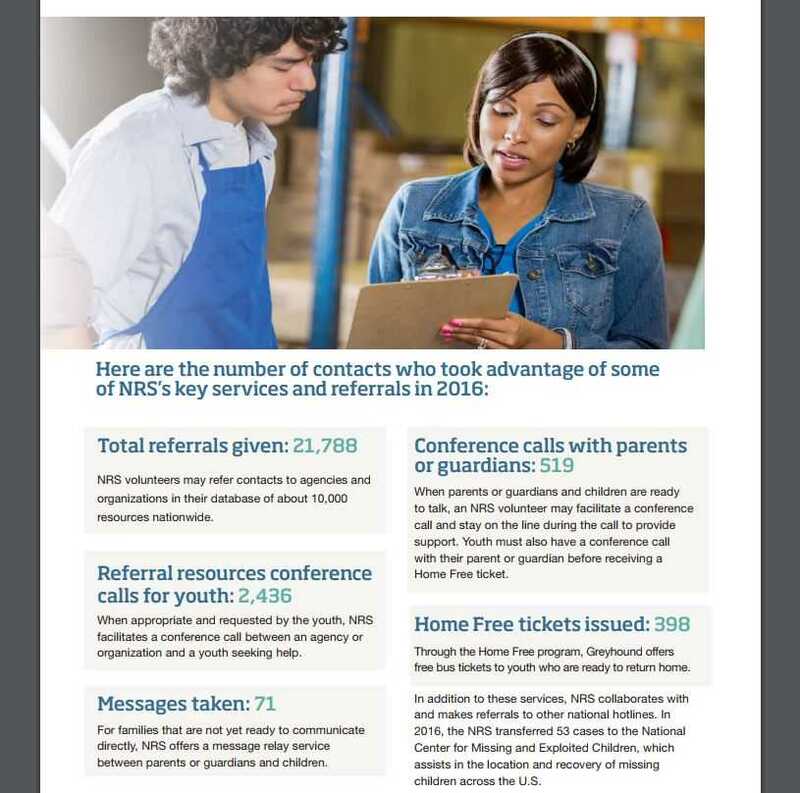 Of the 29,000+ contacts of youth, NRS gave nearly 22,000 referrals to resources around the nation. 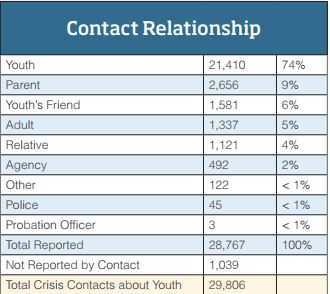 2,400+ conference calls between youth and agencies were facilitated. Nearly 500 conference calls between youth and parents were arranged. Almost 400 Home Free tickets on Greyhound Bus were issued. Interested in helping NRS’ mission? Learn more about volunteering through our online volunteer orientation!